The all new Sep-Ex 48V DC drive system allows maximum drive performance resulting in 35% gradeability and 3.5 mph travel speed. The Sep-Ex motor controller eliminates the need for forward/reverse contractors or speed sensors. This reduces complexity and improves the reliability of the drive system. The Sep-Ex drive motors and controller provide automatic hill braking and ramp braking. Ideal for confined work spaces-the Z-30/20N is only 47 in (1.47 m) wide and has zero tailswing. Rolls through standard double doorways. 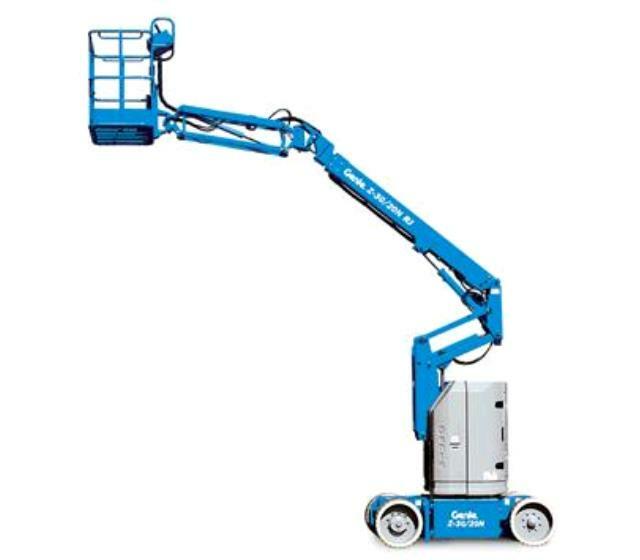 The Z-30/20N narrow boom works both indoors and out with emissionfree, noise-free electric drive. A standard 4 ft (1.22 m) jib boom with 144 range of motion operates above or below horizontal throughout the full boom range of motion. 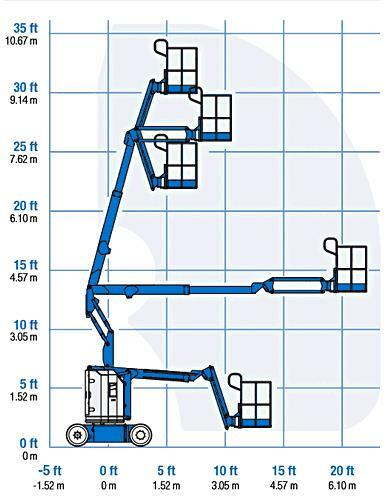 The combination of 40 ft 4 in (12.5 m) working height, 22 ft 4 in (6.8 m) outreach and up and over clearance of 15 ft 3 in (4.6 m) provides the most versatile range of motion in its class. 160 powered platform rotation allows easy operation and precise platform positioning. Compact storage length of 13 ft 9in (4.2 m) and width of 47 in (1.47 m). Dual parallelogram riser design allows ascent and descent along a vertical plane without retracting or extending the boom.